Well, nobody saw that coming. 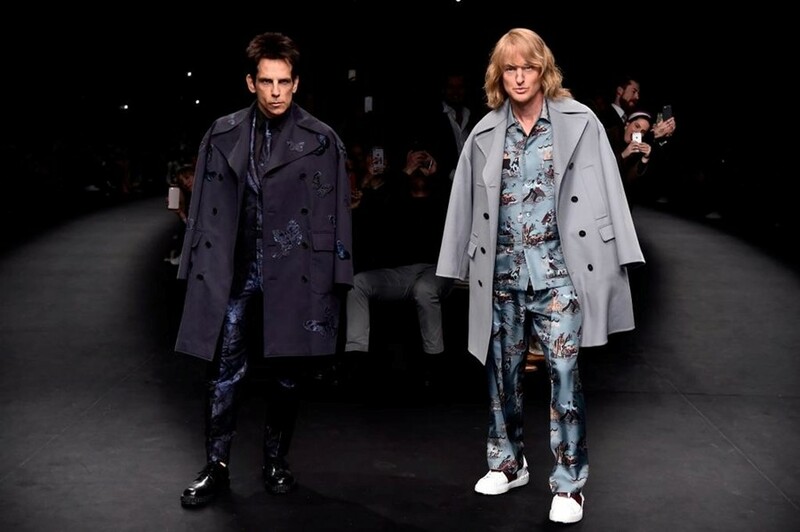 Ben Stiller and Owen Wilson closed Valentino AW15 at Paris Fashion Week on Tuesday, reprising their respective Zoolander film roles of Derek Zoolander and Hansel for the show. UPDATE: Paramount Pictures confirmed on Twitter that the model walk-off was to launch the sequel to the film. Zoolander 2 is coming out on February 12, 2016. The two actors walked the runway to the sound of "Don't You Want Me" by Human League, prompting applause and gasps of disbelief from those assembled. Stiller wore a black brocade two-piece suit with a coat slung over his shoulders (very #fashioneditor). Wilson was in a slinky blue silk pyjama set with a pale grey coat, also worn across his shoulders. "Fashion can be very serious but it can also be fun too," Valentino designer Maria Grazia Chiuri told us backstage, adding, "I loved the first film, I watched it when I was really young." Valentino uploaded images of the two stars staring each other down on the runway, writing: "Marie Antoinette once said, 'Let them eat cake.' Derek and Hansel have certainly devoured this runway." Looks like Blue Steel is about to make its runway comeback. IMG also filmed Stiller and Wilson (still in character) on a very bouncy shoot outside the Eiffel Tower with Swedish model Tilda Lindstam and Margiela girl Xiao Wen Ju. Call this method acting, but you can't deny these guys are anything less than 100% committed.